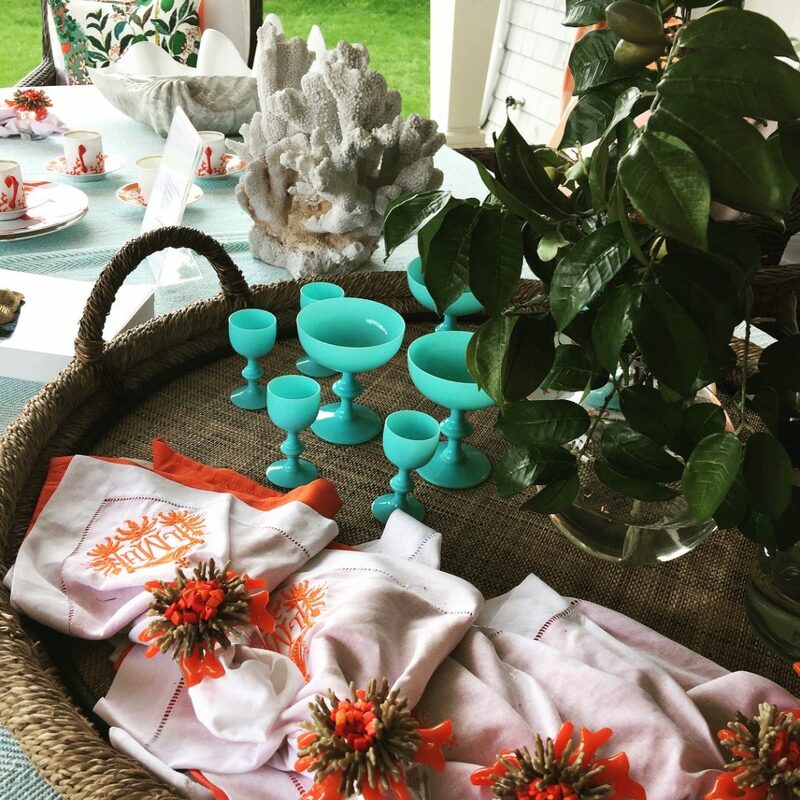 One of my favorite summer traditions is joining friends on Shelter Island, hosted by the fabulous Deborah Klein of DK Inside Designer, for a spectacular weekend of food, design and shell collecting. We call ourselves the #SeaSippinSistas as you’ll find us soaking up the ocean’s soft Eastern light (nursing mojitos) at sunset. 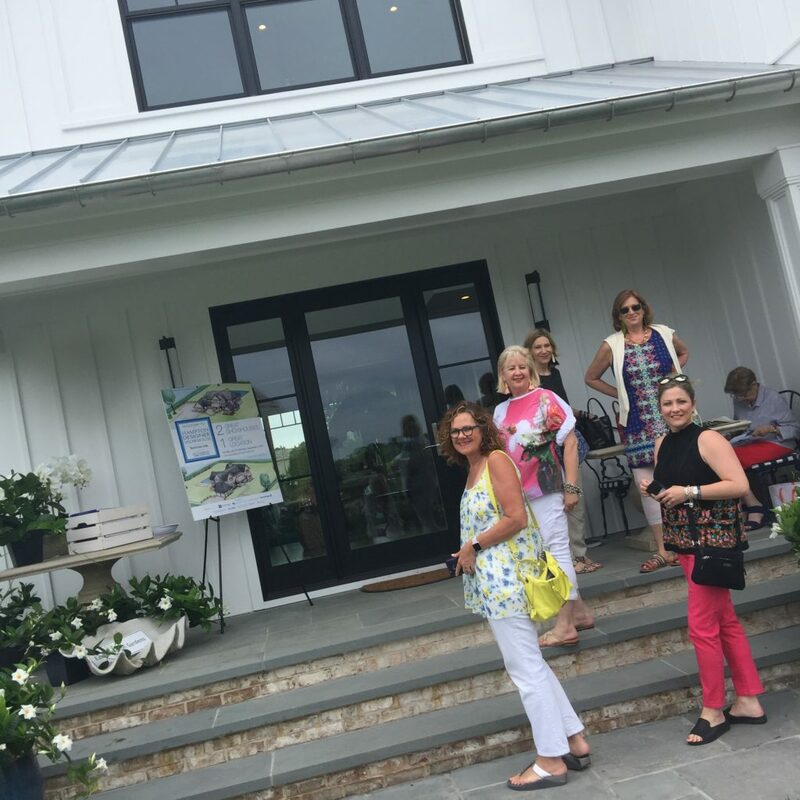 It’s also our group’s tradition to visit Traditional Home’s Hampton Designer Showhouse on opening day, benefitting the Southampton Hospital. 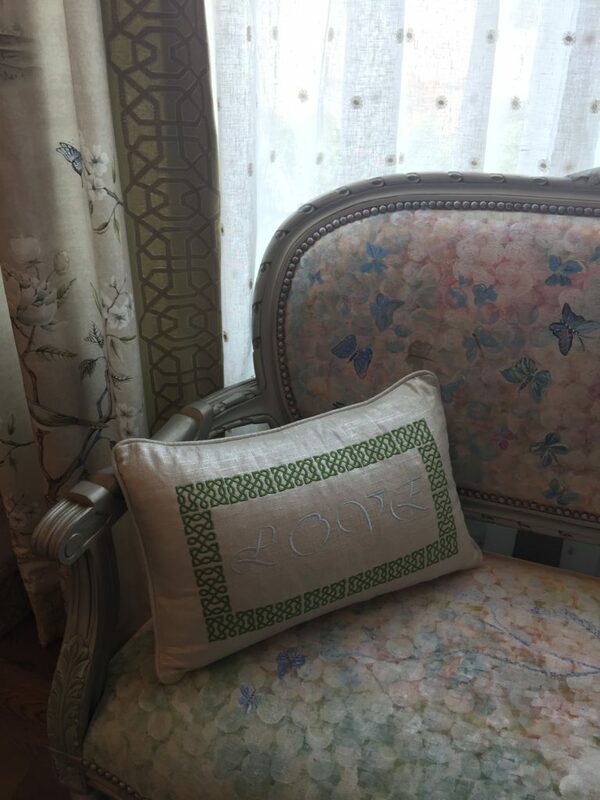 As you might know from my previous coverage of the showhouse, we are grateful for the quality care it provides for my mother-in-law who lives locally. It is a large undertaking to make this showhouse happen, thank you to all the philanthropic designers and sponsors for sharing their time, talent and dedication. 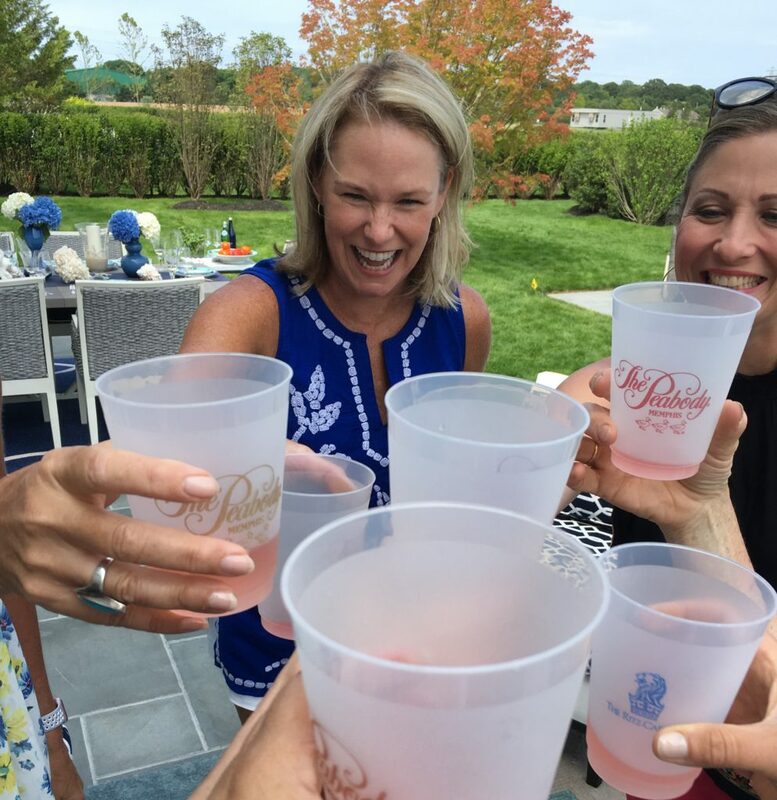 The #SeaSippinSistas report for #trimspotting – Ruth Olbrych, Betty Lyn Eller, Katie Matushak, Deb Klein and Dorian Sims descend on the showhouse in The Fields – Southampton. The secret perk of visiting opening day, is that many designers are at the ready, greeting guests to share their inspiration. 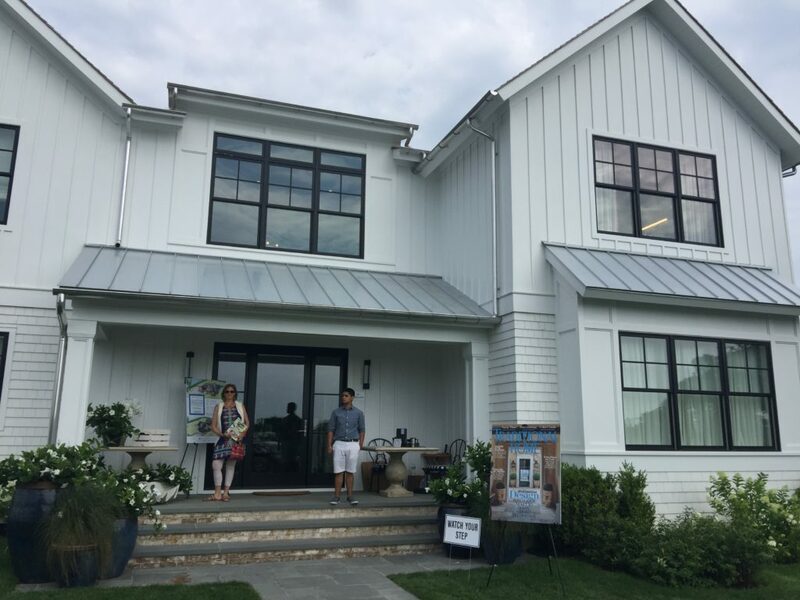 This season, there were two homes that served as the palette for the designers, the Beachcomber and the Linden House at The Fields in Southampton built by Paramount Custom Homes. 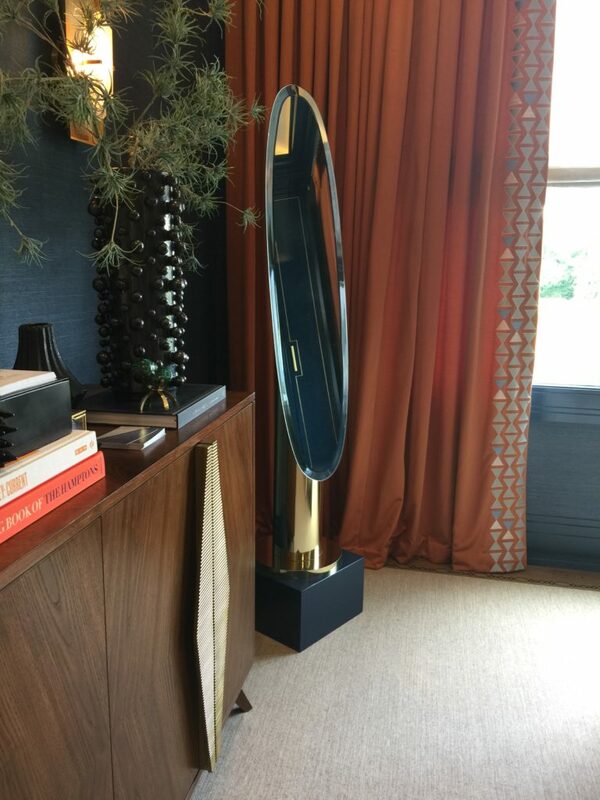 As per usual, I had on my #trimspotting lens, in search of how the rooms would incorporate modern embellishment. With my design sistas on board, they chimed in with their keen eye for design and we had an engaging afternoon meeting many of the designers. These are our collective embellishment highlights, visit the showhouse to see ALL the rooms. Two homes were selected to showcase designers’ work. This is the Linden House. Calm and cool, Melanie Roy greeted us with textile designer Judy Ross. This bedroom mixed organic textures, linen, jute, natural woods with contemporary pattern in the artwork and textiles. Both of these women obviously love design and also have a passion for sharing it. 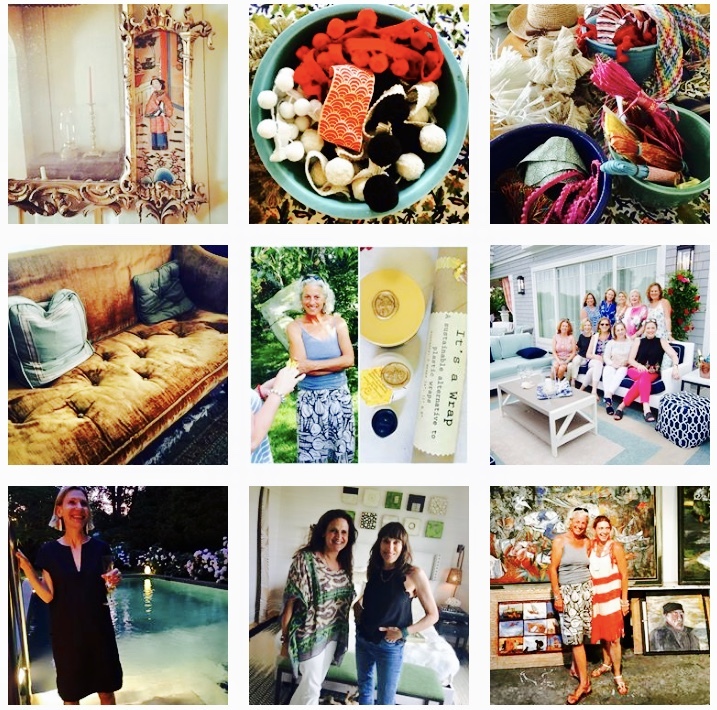 I had been following Judy Ross Textiles on Instagram for a while so it was a thrill to meet her in person and get the insider tour of her work throughout Melanie’s guest bedroom and bath. 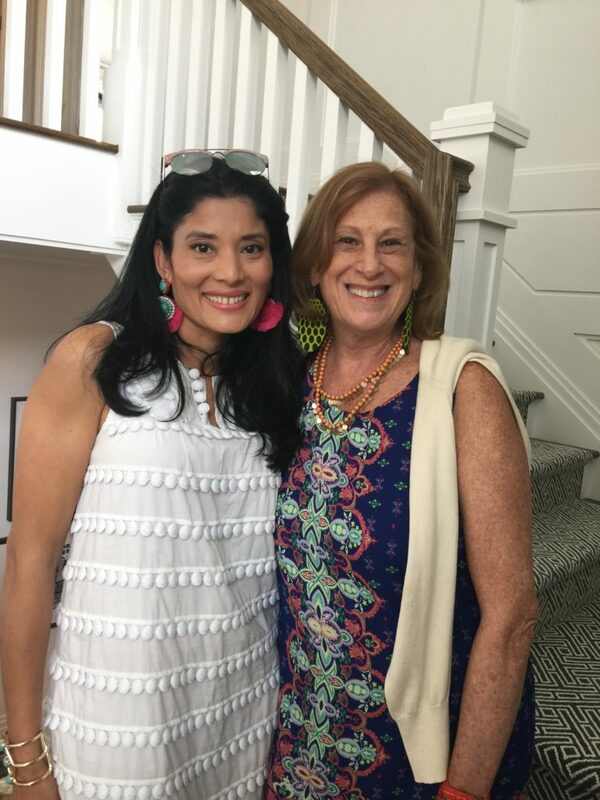 Interior designer Melanie Roy with textile designer Judy Ross. Melanie’s room was sponsored by Garnet Hill. 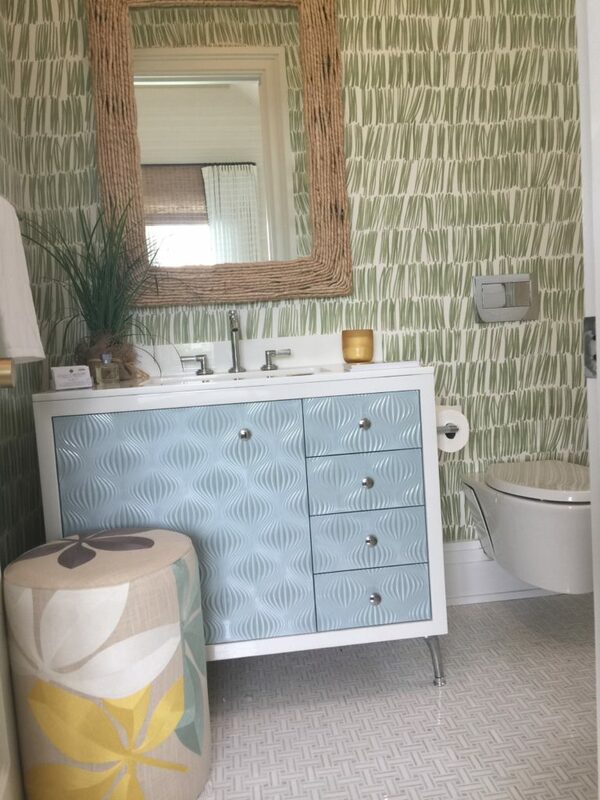 Melanie Roy designed bathroom with Judy Ross Textiles in collab w Garnet Hill. Fringe edged rug and bead fringe leading edged drapery. Ashbourne by Christine Gentile gave this room an exquisite, classical design, detailed to perfection. The embroidered linens, trimmings on the pillows, and window shades gave cultured ambiance to this room. 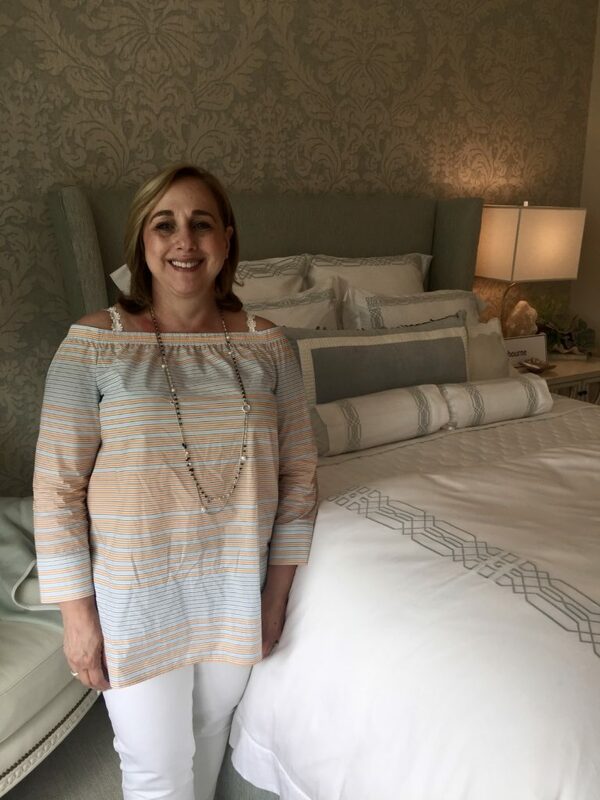 Christine Gentile of Ashbourne in the bedroom she designed for the Hampton Designer Showhouse. 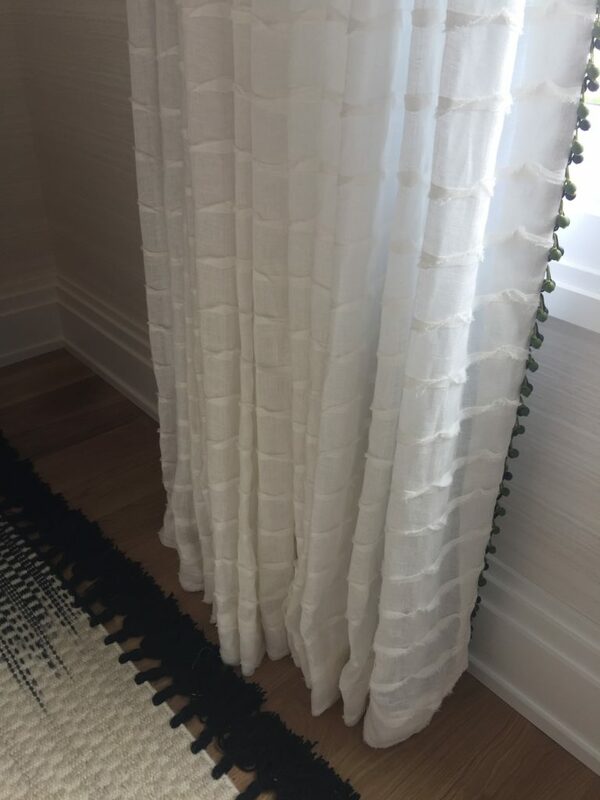 A beautiful linen trim creating a windowpane design paired perfectly with a shell fringe from Fabricut. 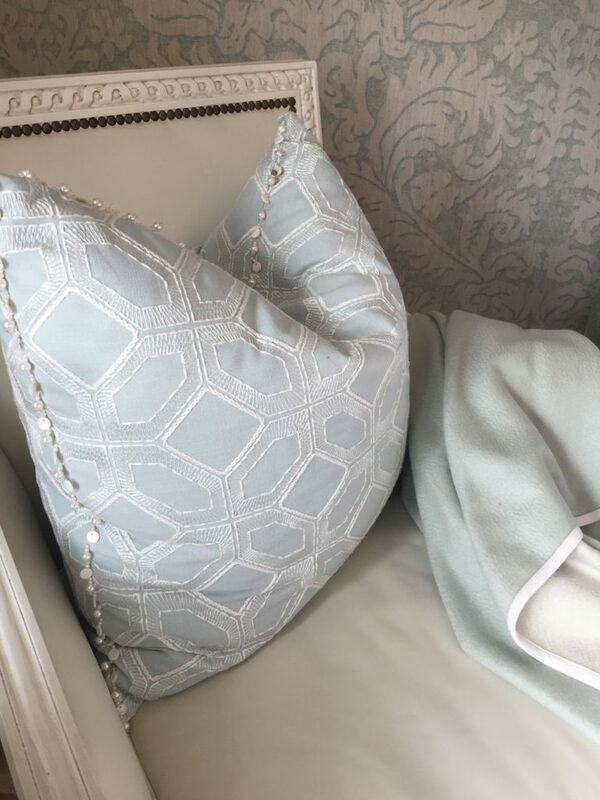 Fabricut’s delicate pearl bead trim outlines Ashbourne’s luxurious pillow. 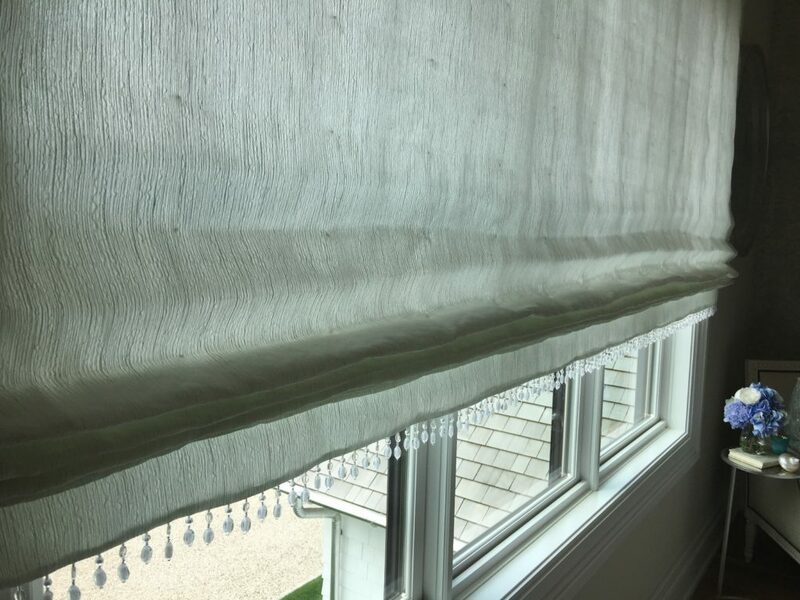 You’ll be seeing lots more of this beaded fringe trend edging window shades. This gorgeous glass and acrylic bead trim is from a Fabricut collection. 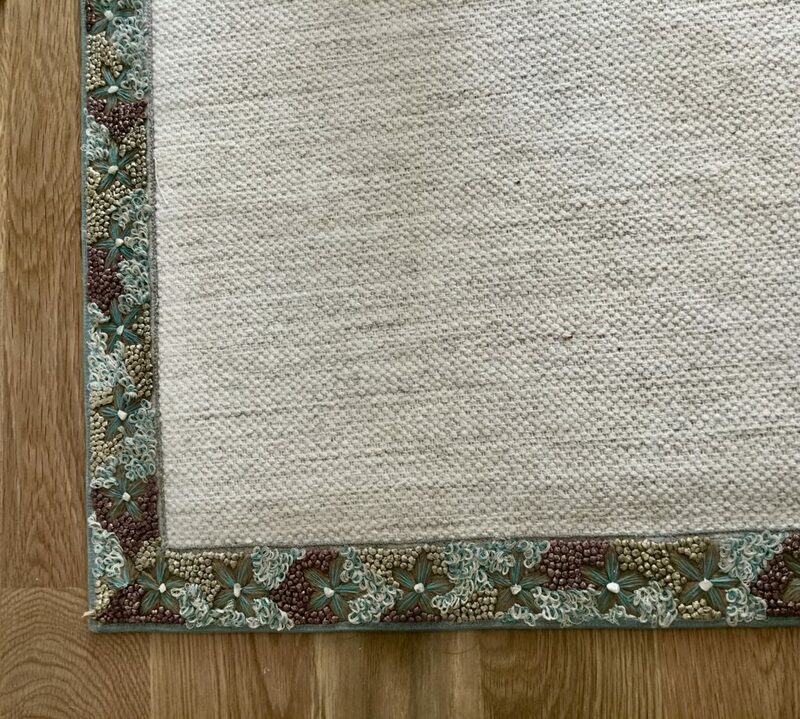 Christine uses the tape as a rug binding, so gorgeous! Exquisite “Embroidered Garden” tape by Stroheim. Photo via Ashbourne. Stepping into Eddie Ross’s festive master bedroom was like stumbling into the most deevine party. The pattern play was so uplifting, with a design conversation happening at every eyeful. As style director for The Mine (formerly ATG Stores) and author of the Modern Mix, Eddie showcased what is possible to achieve with The Mine’s “best of” sources. You can even take a virtual tour of his room here. 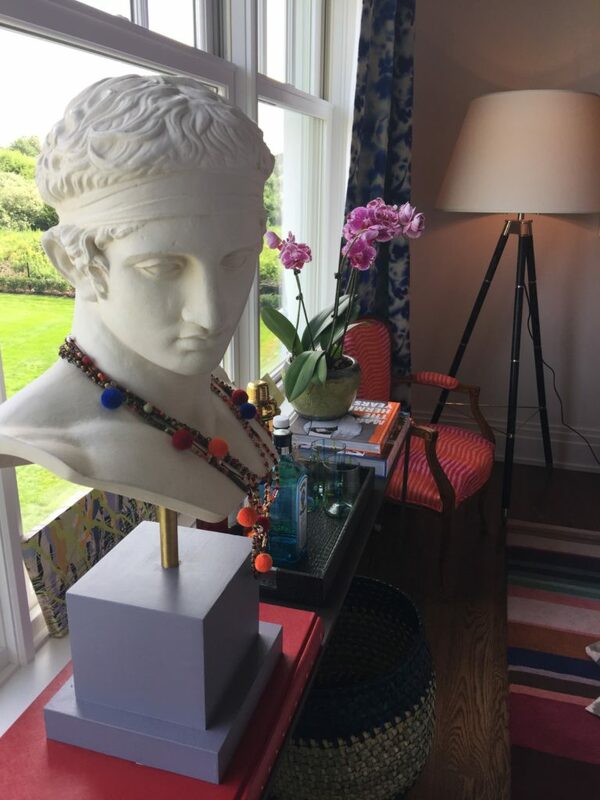 Maximalism of Eddie Ross at the Hampton Designer Showhouse, photo via The Mine. 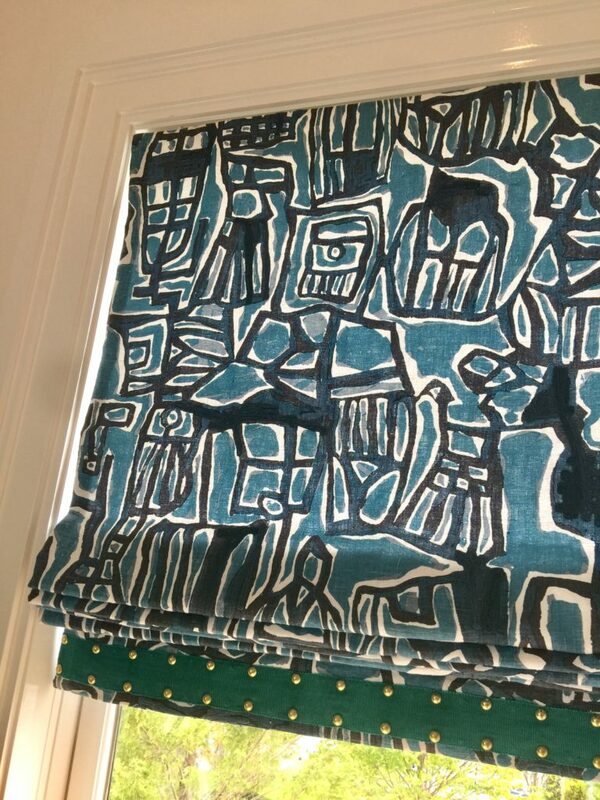 Studded tape trim finishes the base of the shade and adds pattern play too. A design convo at every turn. Appique fabric Demetrius by Thibaut. 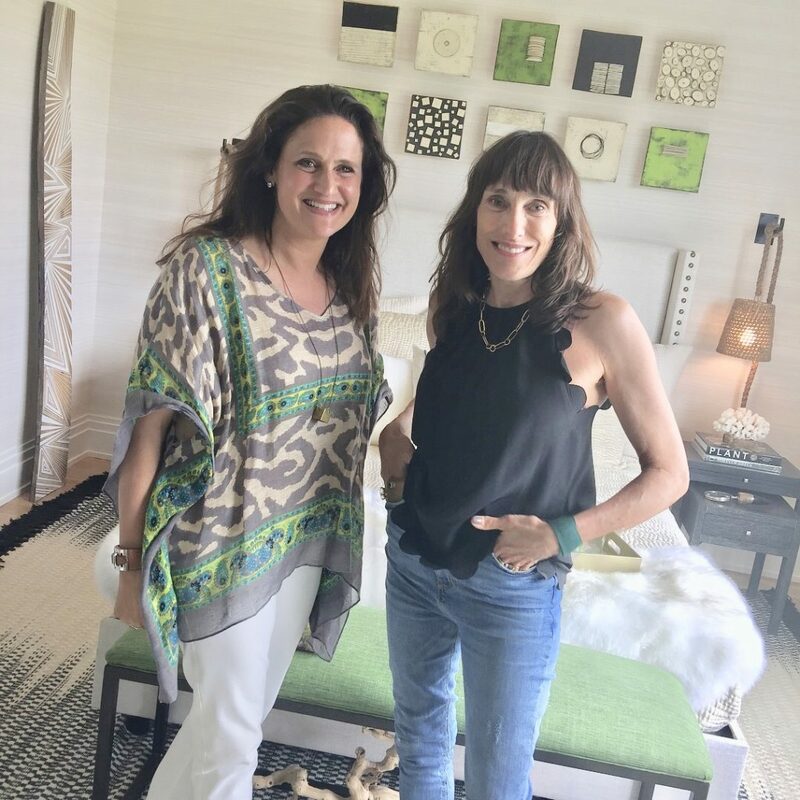 Anelle Gandelman and Ariella Duker of A-List Interiors wow’ed as we entered the downstairs lounge with a sleek, channel tufted sofa as the centerpiece. 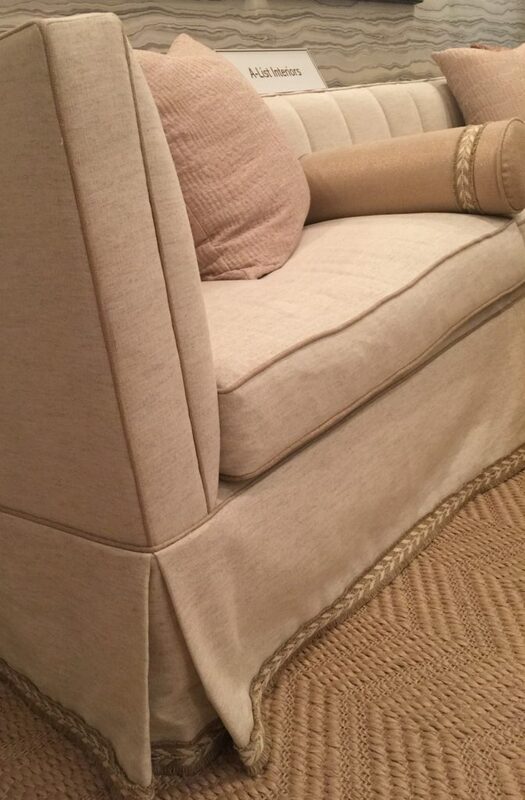 The sofa skirt and bolsters are detailed in Linen Dart trim by Robert Allen Design. It’s a great design trick to break up the solid textiles and length of the sofa with the trimmed bolsters. Love it! The soft palette of grays, platinum, champagne and blush, create a glamorous space for many a tete-a-tete, I imagine, over bubbly. 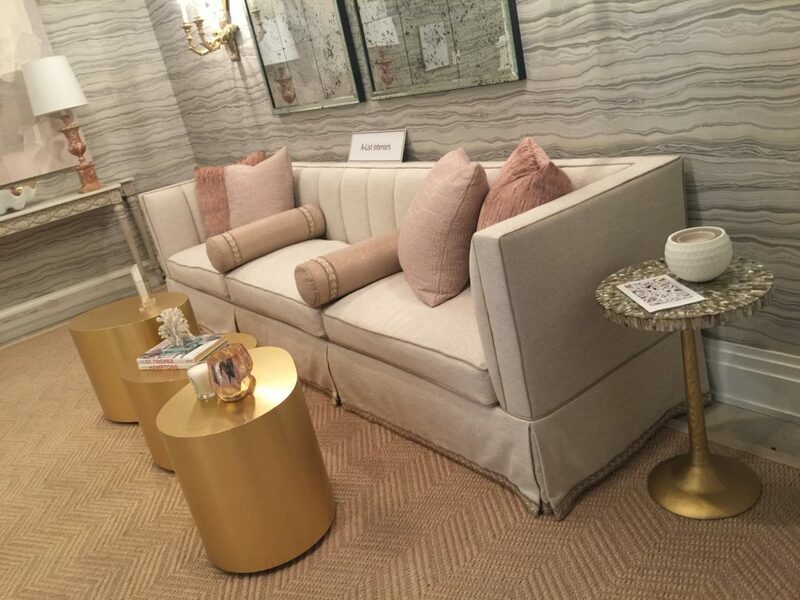 A-List Interiors Lounge space with Thibaut Treviso wallpaper. 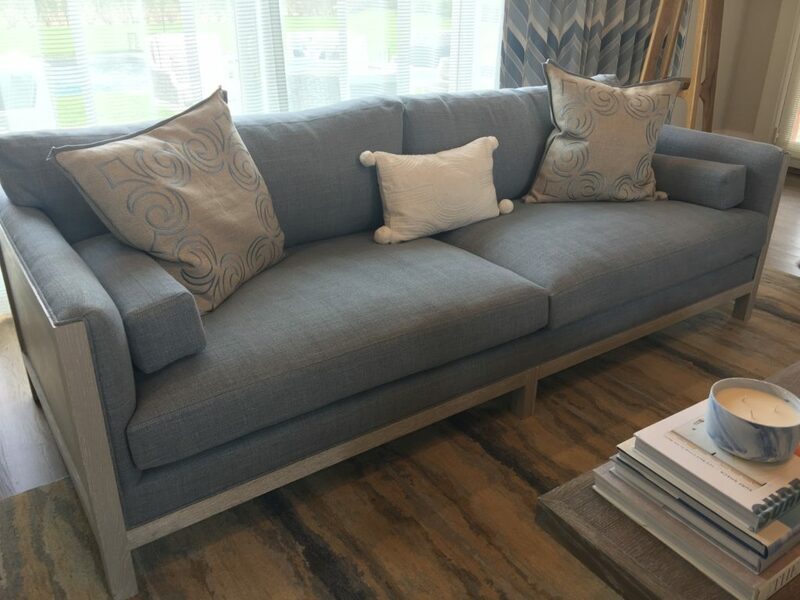 Custom sofa by Hailey Furniture Group using Robert Allen Linen Dart tape trim. People debate about where the Hamptons begin and end. 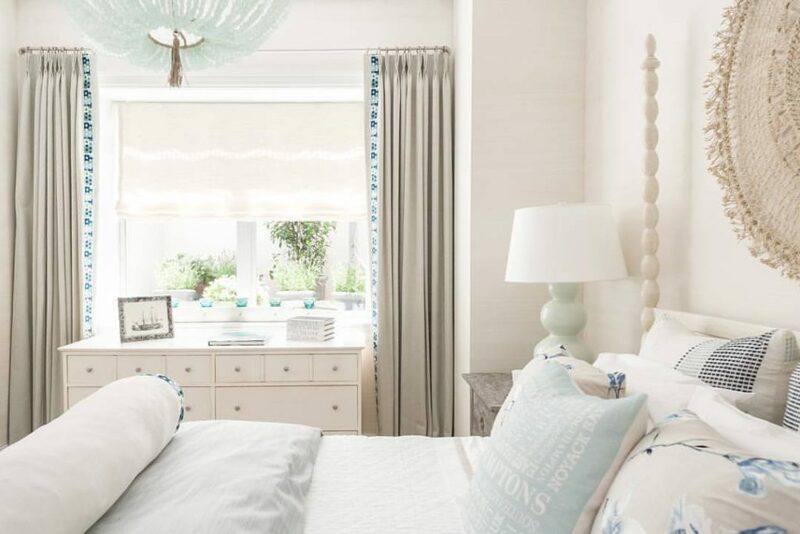 Whether Montauk is in, or not, it’s relaxed, boho style, is au courant and Sea Green Designs created a Beachcomber’s retreat that vibed an all-the-way East getaway. 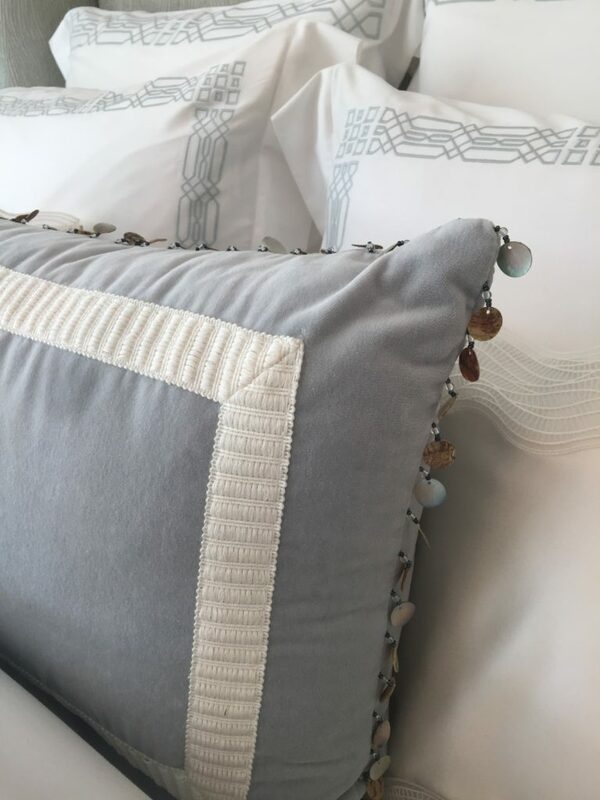 Shannon Willey mixed natural materials like linen, cotton and jute with a serene coastal palette. I could have plopped and stayed all weekend on the plush Bunakara Indian Bed that was in her study room. 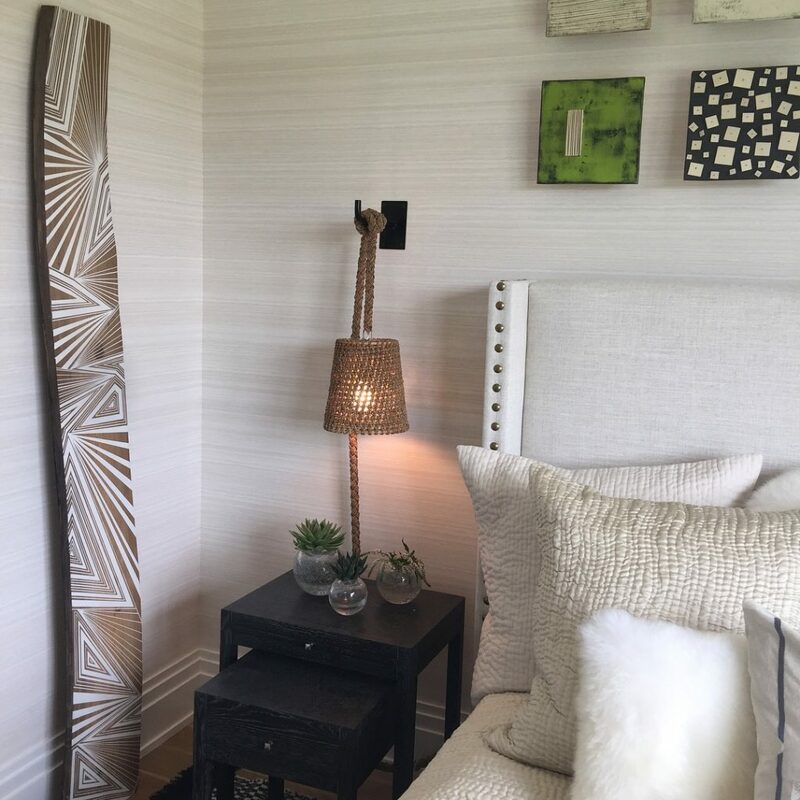 I trimspotted one of my favorite all-time embellishments, a Lee Jofa Kelly Wearstler trim, straight away, used on the bolster pillow and window treatments in the bedroom retreat. Tassels and fringe create a boho vibe. Wallhanging by The Dharma Door. The Indian Bed is by Bunakara. The Ro Sham Beaux chandelier is made from recycled coke bottle glass. Isn’t that hanging jute tassel the perfect touch? Shannon not only has a design business but also has a retail shop in Southampton Villiage on Job’s Lane. 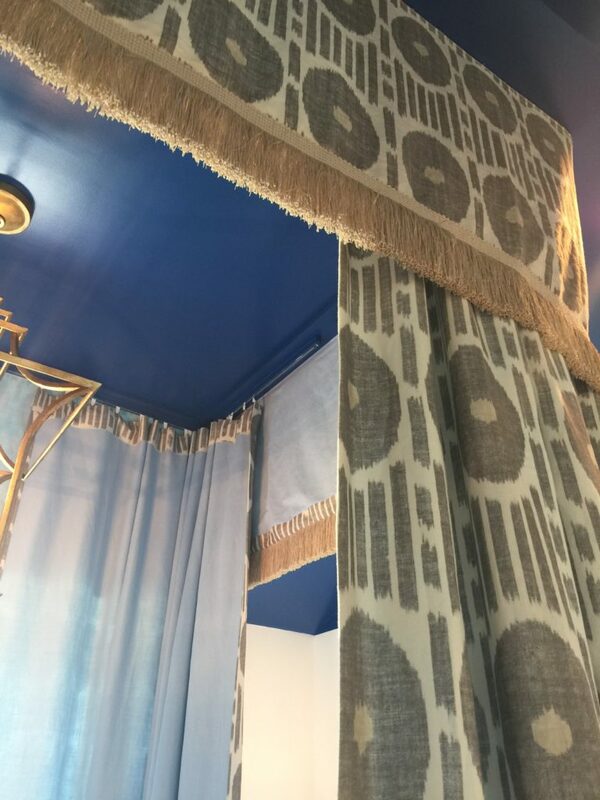 Hartmann & Forbes custom drapery with Lee Jofa/Kelley Wearstler’s leading edge trim. Photography by Sequined Aspault. 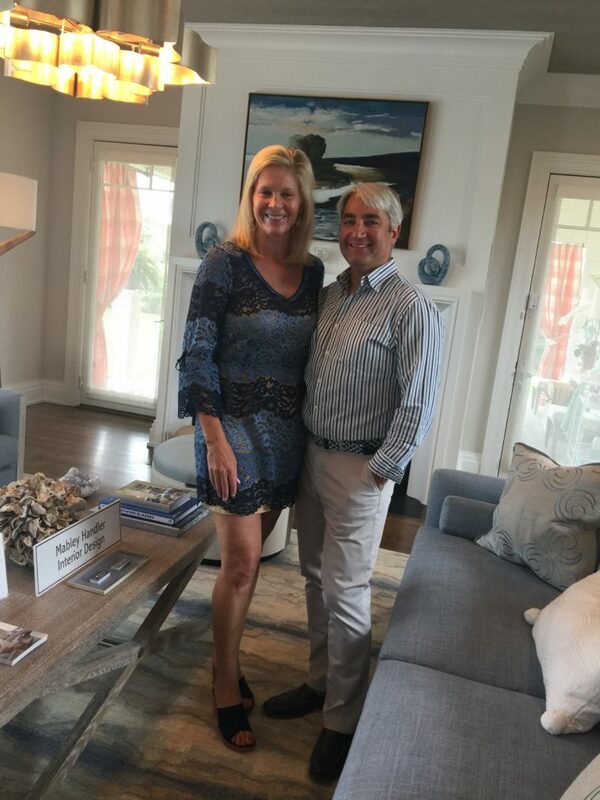 Gregory Shano and Michael Giannelli recently opened East Hampton Gardens on Gingerbread Lane offering a fresh take on elegant garden design and outdoor living. Their design terrace, and covered porch design in the Beachcomber House, is both classic and fresh. Gregory Shano and Michael Giannelli re-launched East Hampton Gardens this Spring. Here we find the casual and elegant fruits of their labor! 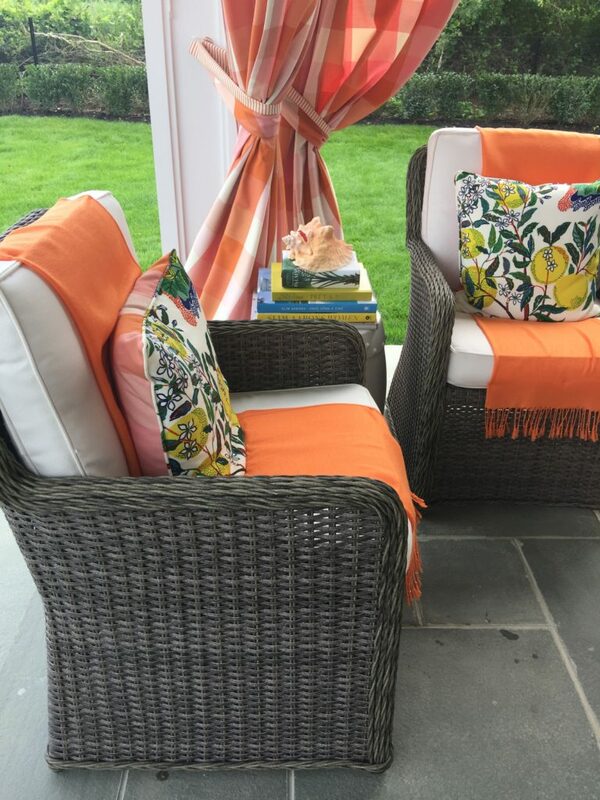 Samuel and Sons’ performance brush fringe adds “cozy” to the patio while being a graphic textile outline. Passementerie-inspired placemats by Julian Mejia add elegance to entertaining. 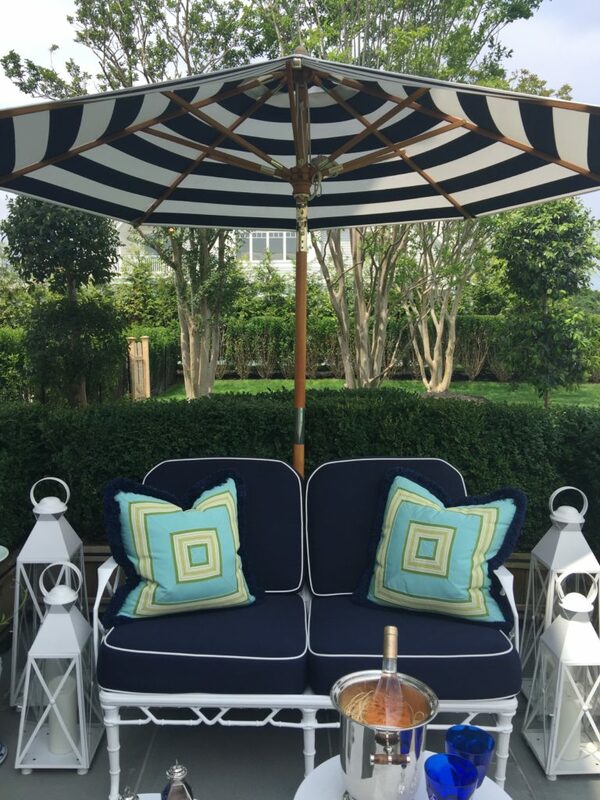 Sunbrella pillow fabric by Thibaut. All products avail through EHG. We began our journey to the second showhouse from the pool side. 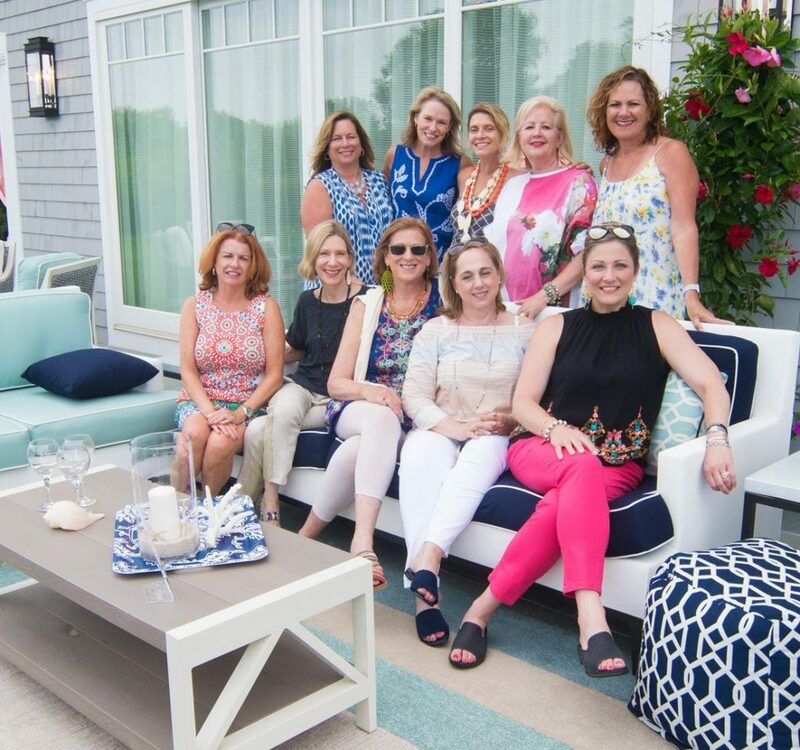 Interior design friend, product designer and media personality, Libby Langdon invited the #SeaSippinSistas to her domain of the Linden house, the outside terrace. The Linden House at The Fields at Southampton. 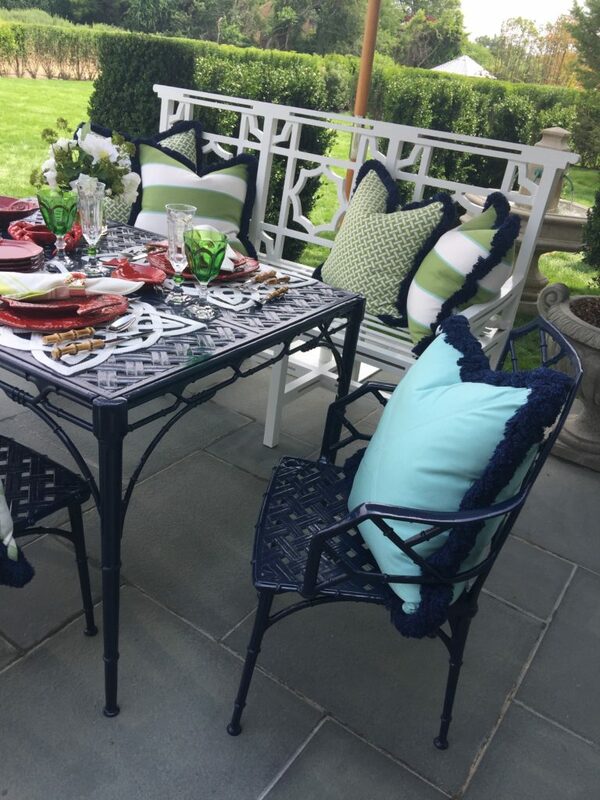 Although Libby doesn’t have any trimmings YET on her gorgeous outdoor furniture collection from NorthCape, I just had to include her space because it’s quintessential to the Hampton lifestyle. Lounging with Libby, furniture by NorthCape. Photo via Paramount Custom Homes. 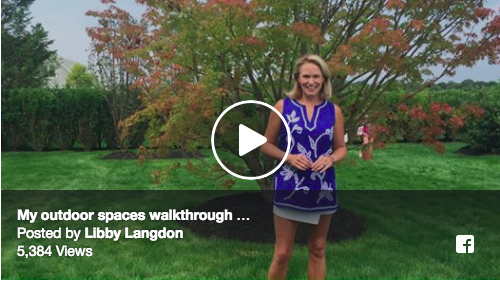 Catch the video tour of the pool terrace I helped film, she is so impressive on camera, she is a true tv personality who thinks on her feet. 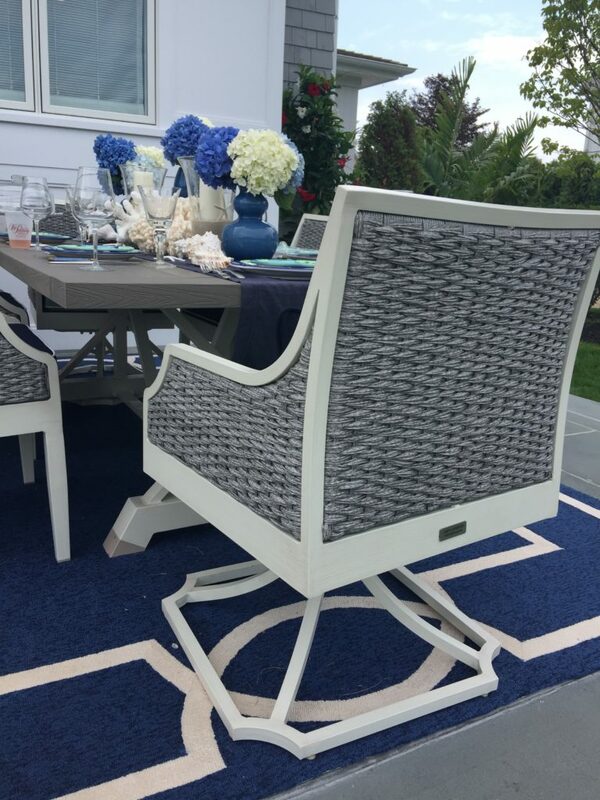 The Mooring Swivel Chair is made of durable resin wicker in a gorgeous Nantucket Gray water hyacinth weave. Libby recently introduced her outdoor rug collection by KAS Rugs. Through the window, from the terrace, I spied the grand Family Room designed Mabley Handler Interior Design. 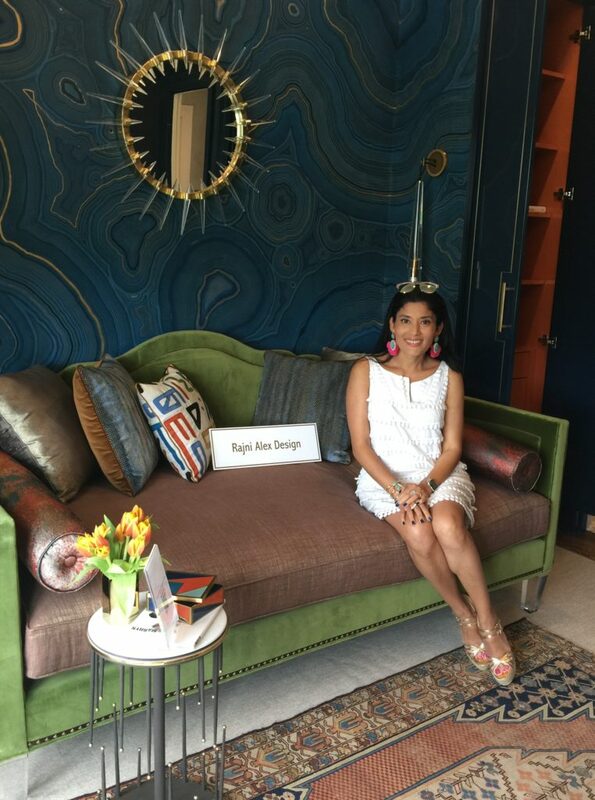 I had seen their impressive Curated Kravet furniture collection launch at High Point Market but it looked even more impressive in a real life setting. I spied Jennifer’s dress with lace and fringe and the woven cord of Austin’s bracelet and belt. I couldn’t help myself! They were good sports about letting me get close-ups of their clothes. This couple exudes refined coastal living, and style. Jennifer Mabley and Austin Handler exude a refined coastal lifestyle of Mabley Handler Interior Design. 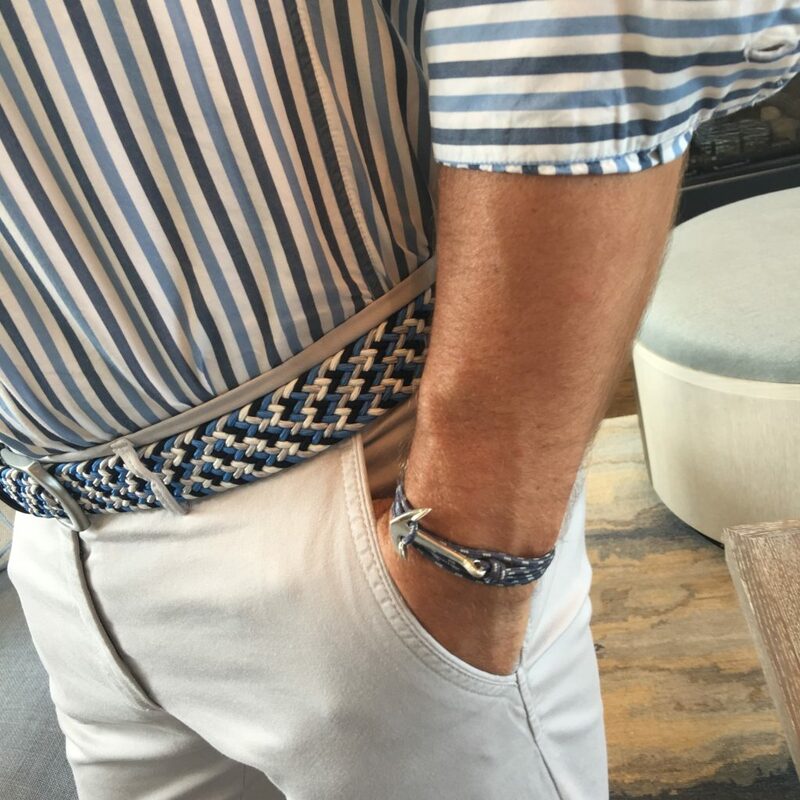 #trimspotting Austin’s Italian woven belt and anchor bracelet. 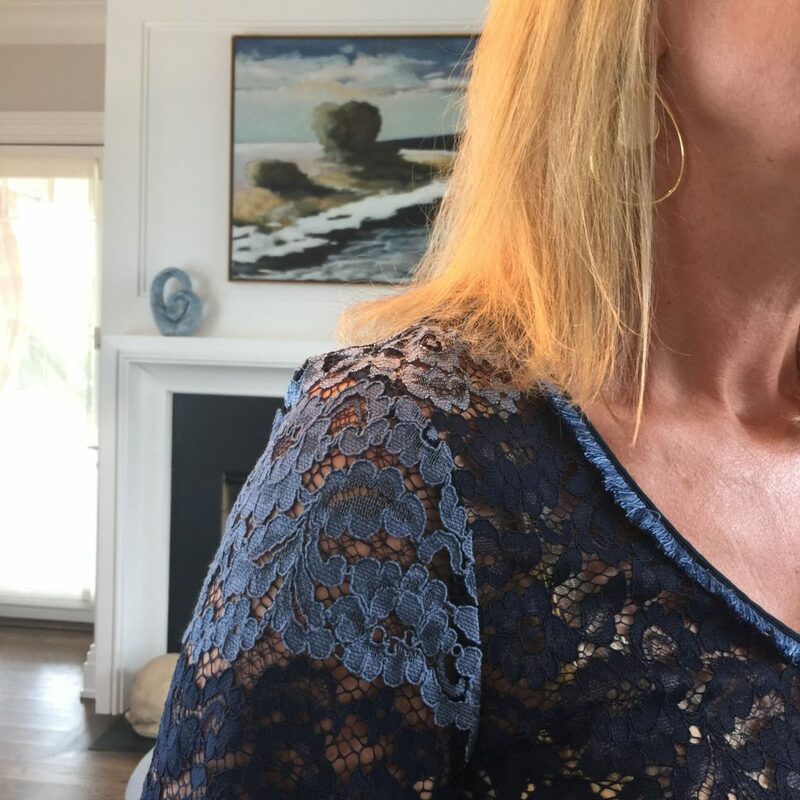 #trimspotting Jennifer’s petit fringe on her chic lace dress. Look at the gorgeous lines of the Flying Point Sofa. highlighted by its sand cerused oak finish. The linen textiles and embroidered pillows by Michelle Hatch NY with some fluffy pompoms speak to modern embellishment. 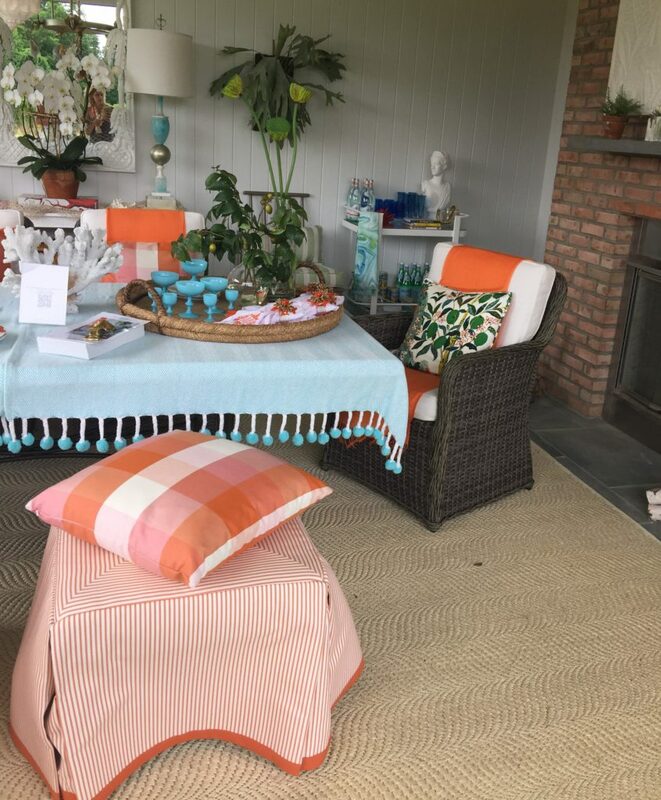 Lisa Mende’s covered porch was definitely a colorful highlight of the showhouse and has been the press’ darling. Her design was inspired by casual summers spent on the coast of North Carolina and if you know Lisa, her charm as a hostess shines through her work. I love how she mixes the natural materials of the shells with contemporary coral fabrics and the pompoms. 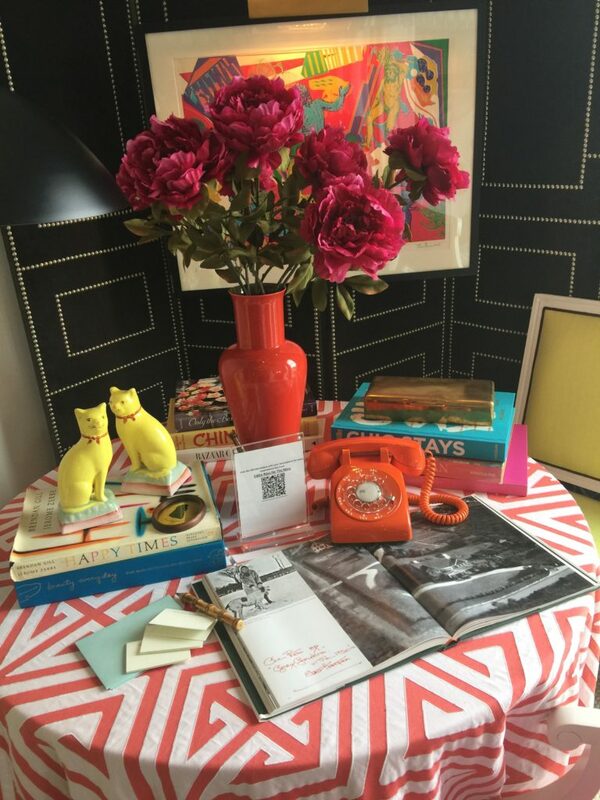 The vintage pieces add levity to the space that would make any guest feel at ease. Dining chairs by Woodard Furniture, accessories by Ballards, fabrics by Perennials. Gorgeous french blue cordials and coupes by Replacements. Monogrammed napkins by South of Libbie and napkin rings by Julian Mejia. 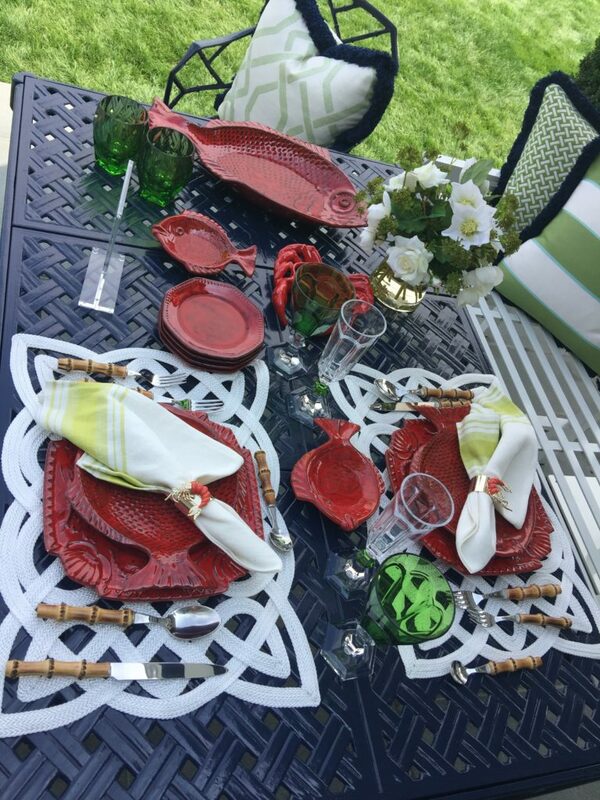 Fabrics by Perennials, accessories by Ballard Designs in Lisa Mende’s Outdoor Dining Porch. 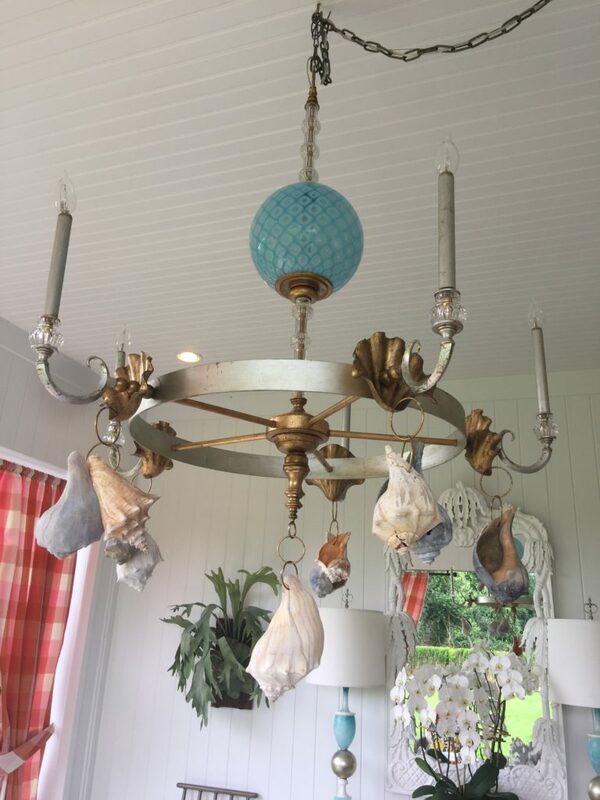 Custom Murano Glass and Shell Chandelier by Louise Gaskill. The guest bedroom designed by Rayman Boozer of Apartment 48 is my personal favorite. I couldn’t pinpoint WHY, it was just EVERYTHING! 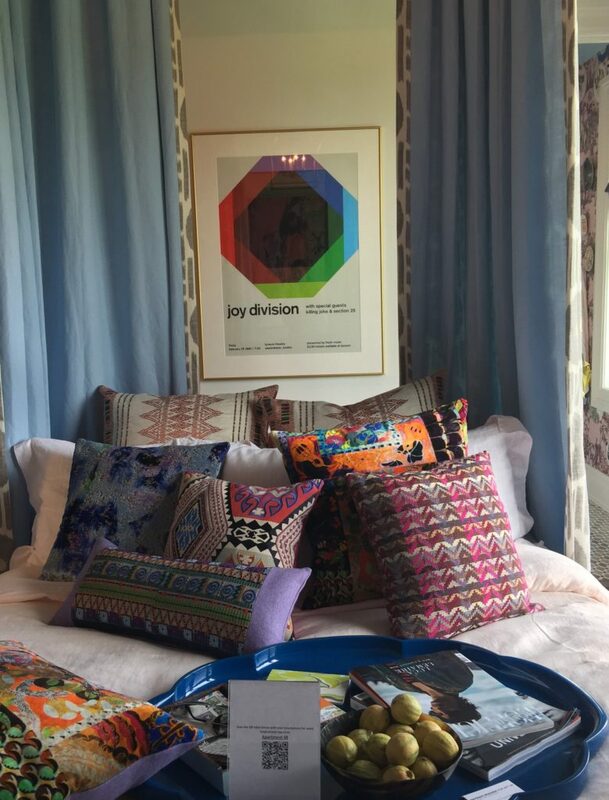 The mix of pattern, how the canopy bed filled the room, the curated, yet whimsical, artwork and objet played on the classics as only a connoisseur could. 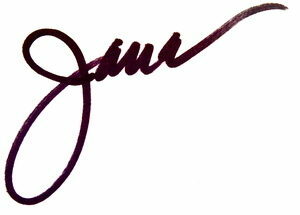 As I uncovered more about Rayman’s inspiration for the design, my admiration was uncovered, he is an Italophile. Inspired by The Talented Mr. Ripley, Rayman created a contemporary take on a retro Italian pensione of the Amalfi Coast. This room was a feast of the senses, chock full of playful bravado, BRAVO Signore Boozer!!!! This room needs a soundtrack. The canopy bed takes up most of the room, like an island oasis. Beautiful textile mix of pillows. Note JOY DIVISION artwork. 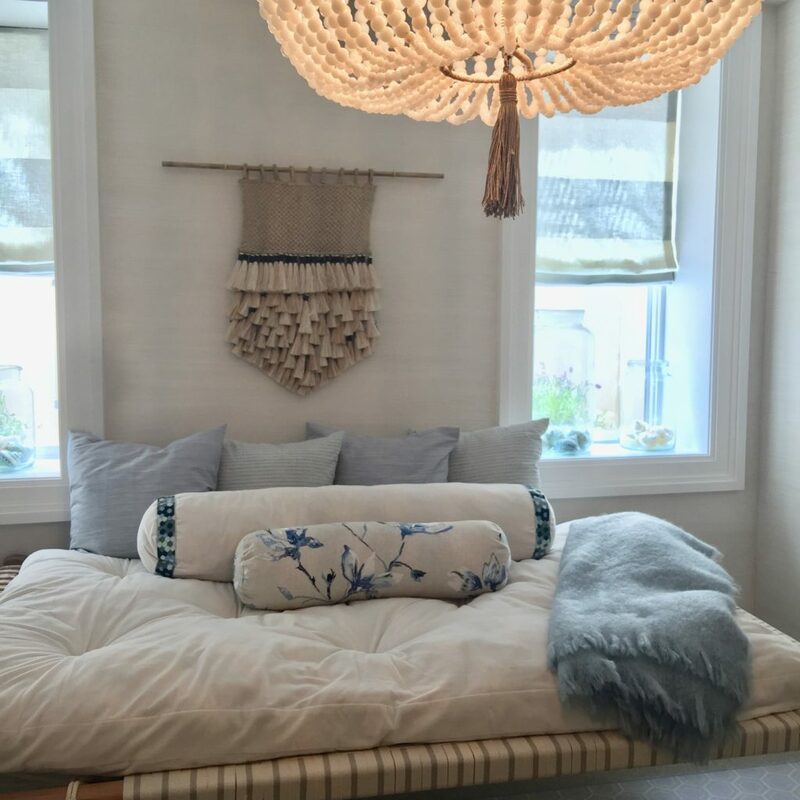 Fringed canopy bed, Mesa Ikat fabric by Thibaut, Samuel and Sons fringe. 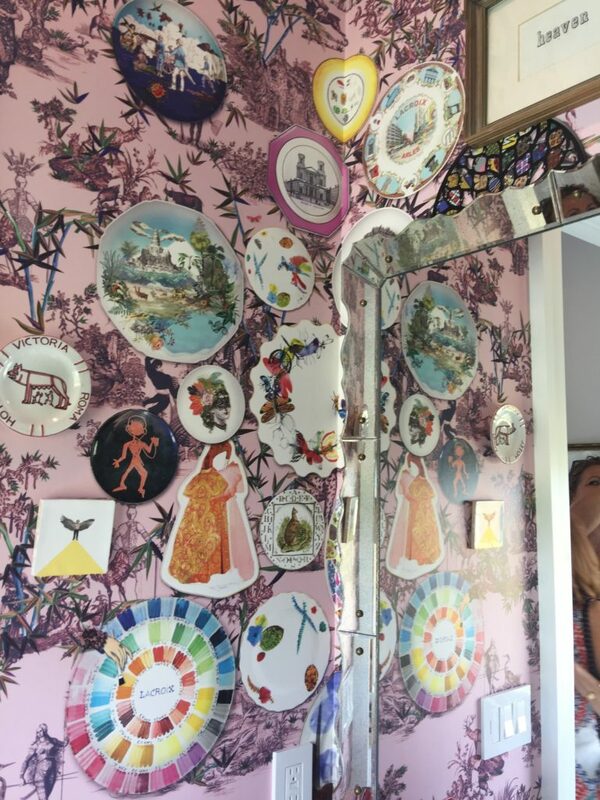 Rayman added a curated selection of Italian plates to a Christian Lacroix wallpaper printed with a trompe l’oeil collection. It creates a real vs. fantasy allure. Dreamy for a bath. Ode to Amalfi. Rayman’s mix creates a beautiful, sophisticated and exotic getaway. Chair fabric Wavelet by Thibaut. Ranelle Wolf delighted us with an over-the-top tour of her romantic bedroom filled with her goddesss paintings. 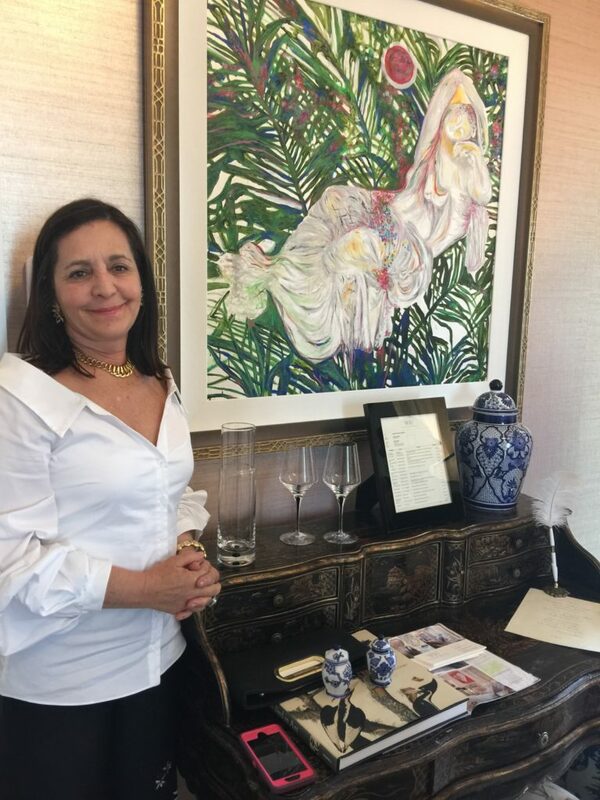 An accomplished artist with a fashion background Ranelle hand paints many of the works in her interior projects. 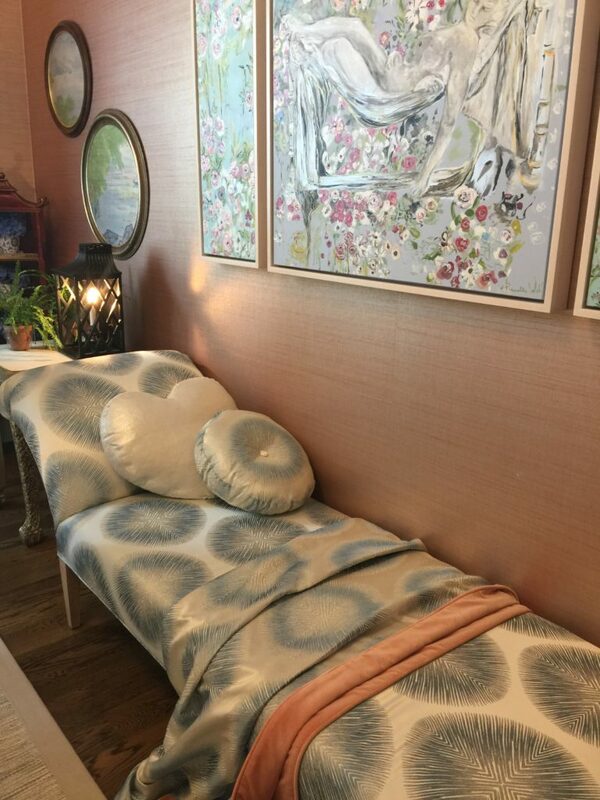 Wolf Designs beautiful day bed with goddess painting. Ranelle’s mission with this room was to have it feel as if saturated in candlelight, to ignite souls. 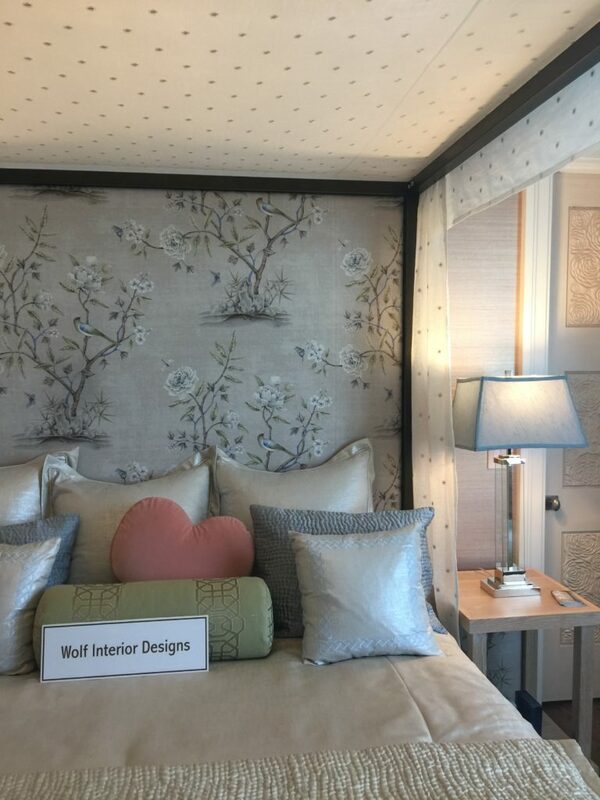 Her touches of embroidery on pillows and window treatments in a soft, romantic palette complemented floral patterns used. Like a life-sized jewel box, Rajni Alex’s bedroom was designed for a discerning woman, one perpetually decked out. The sleek finishes in brass, glass and lacquer, played against the luxurious touch of the suede upholstered daybed, outrageous hand painted geode patterned wall, and embroidered leading edge of the drapery. Rajni Alex exemplifies modern embellishment. Deb Klein greets her client Rajni to give us a tour of her room. Rajni’s jewel box, finishes are over-the-top gorgeous. The hand painted wall is a geode design by artist Caroline Lizarraga. 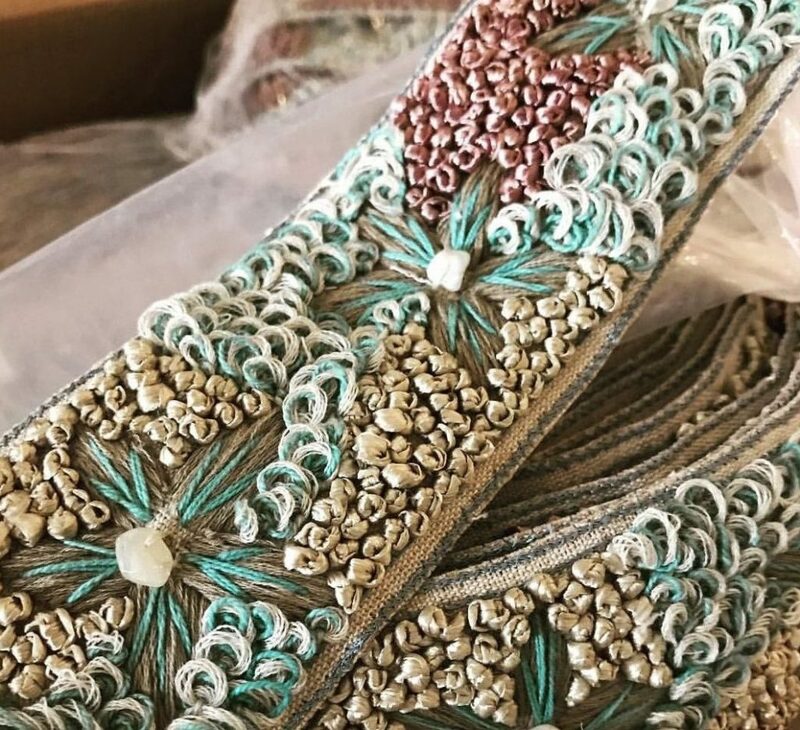 We were so enchanted by gracious Rajni and can’t wait to see more of her elegant projects unfold. 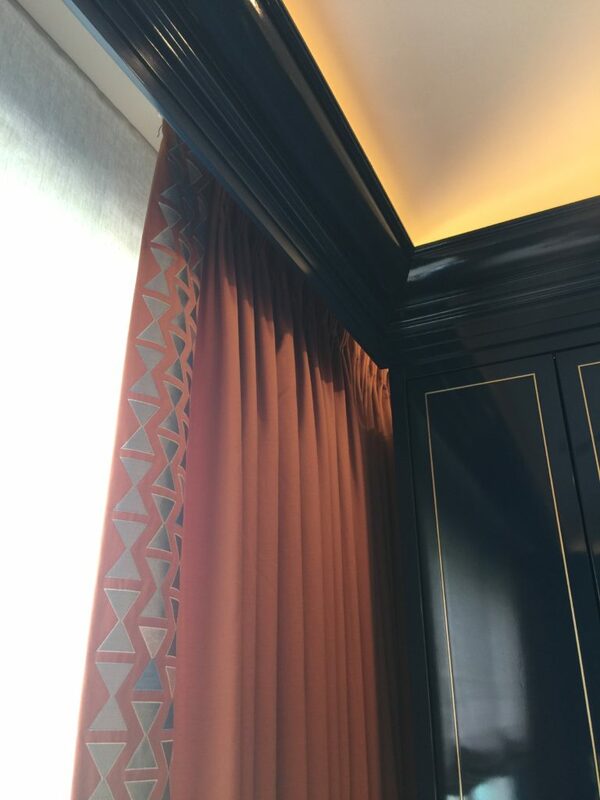 A soft embroidered leading edge of the draperies in a graphic pattern contrast with the high-style lacquered soffit. 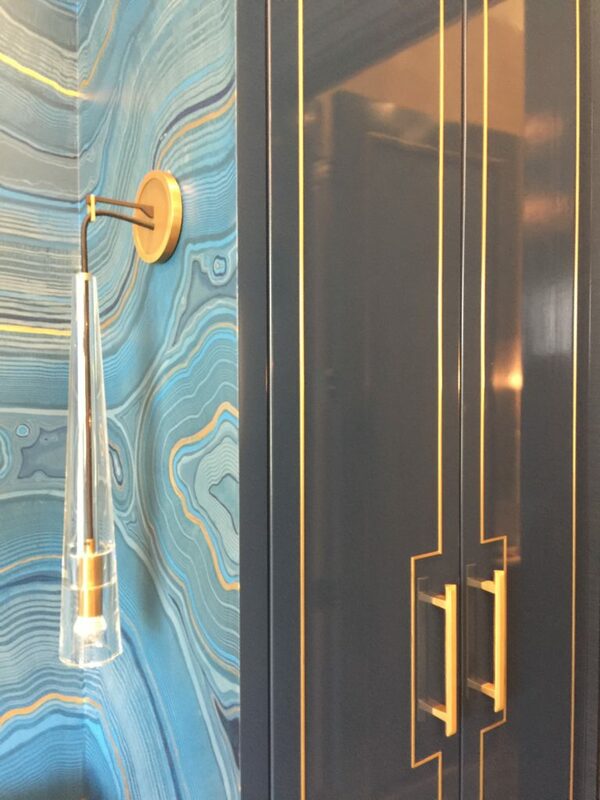 Brass, glass and lacquer shine agains the matte geode painted wall. Hermes-style built in armoire by Arte Wood Cabinetry. 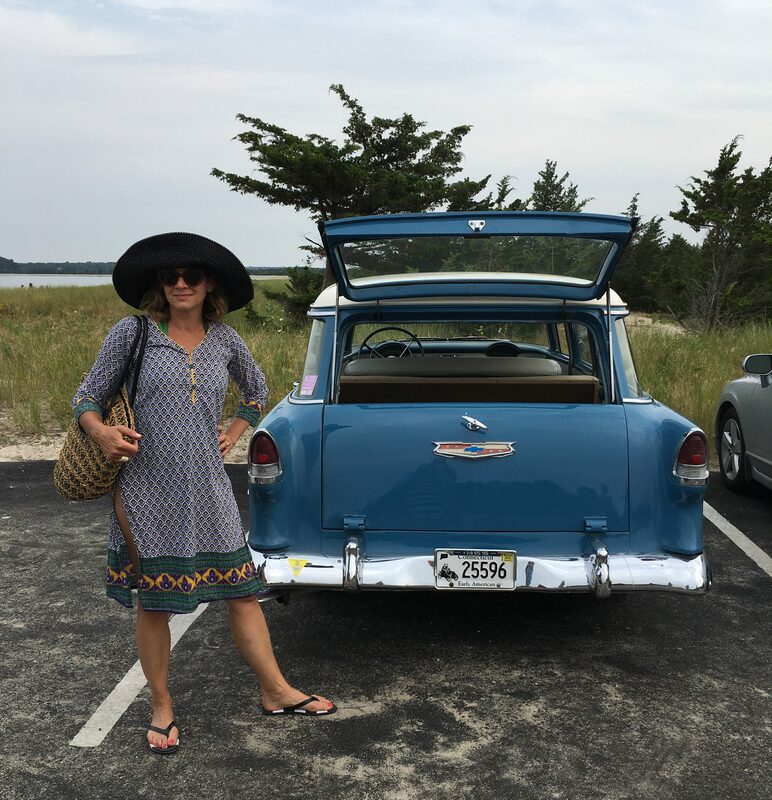 With the Hampton Designer Showhouse closing after Labor Day, it’s signals summers’ end, but like all great traditions, my visit is booked next year with the #SeaSippinSistas. Thanks for reading, and keep #TRIMSPOTTING, I love sharing creativity.